Rotational box jumps combine explosive vertical jumping with exceptional body control and coordination. This article details the advantages and offers coaching points on teaching rotational box jumps. A discussion of plyometric exercises almost always implies explosive and elastic movements that involve the lower body. A visual of an athlete jumping or sprinting is the most common representation of plyometrics, with the muscles and tendons of the legs propelling the athlete up onto boxes, over hurdles, or across a field. Because the lower body is the primary means of locomotion for the majority of sporting pursuits, identifying optimal plyometric exercises for the specific demands of a sport is imperative for preparing the lower body for explosive and dynamic performances. In addition to locomotion, the muscles of the legs are required for landing, decelerating, and changing direction. Training of these muscles must reflect the demands of various sports while not creating a situation where overuse of specific muscles and joints can lead to acute or chronic injury. Awareness of the specific muscles involved in a given sport and the relative involvement of these muscles in lower body plyometric exercises is critical for the development of an effective exercise plan. While many of the same muscles will be used in all of the lower body plyometric exercises, it is important to understand that the subtle differences between one exercise versus another can be the difference in not only improving overall performance but also minimizing the probability of injury. The gluteal muscles, hamstrings, and quadriceps are all involved to varying degrees in lower-body plyometric exercises. The quadriceps are involved in extending the knee in jumping and sprinting movements, but can also play a key role in decelerating an athlete on a jump landing or direction change movements. The hamstrings play a significant role in powerfully extending the hip for explosive jumps and sprint acceleration but also flex and support the knee for many athletic movements. The gluteal muscles are powerful hip extensors for jumping and other explosive movements, and can play an important part in decelerating the body during landings and agility movements. Below the knee joint, muscles of the calf can be involved in both high-speed elastic movements (gastrocnemius) and postural stability (soleus). The well-coordinated involvement of all of these muscles is what produces exceptional athletic performances for both training and competition. Plyometric jumps involving two legs provide a stable means of loading the lower body with high-intensity explosive movements. It is common to initiate a plyometric jumping program with two-footed jumps for this reason. Bilateral jumps equally distribute and share the force of takeoffs and landings over two legs, making such exercises relatively less stressful than single-leg jumps. Once a foundation of bilateral jumps is built over a phase of training, single-leg jumps can be added to provide more complex movements and greater loads on individual legs. Rotational box jumps combine explosive vertical jumping with exceptional body control and coordination. The direction and magnitude of the rotational movement are determined by the actions and intent of the upper body. Simply turning the head and shoulders at the initiation of a jump can create a significant rotational effect. Training this skill is important for all aspects of athletic movement when direction changes and agility are required. The head and upper body act as the steering wheel or rudder of the body. A rotational box jump challenges rotational skill and body awareness. In some sports, such as figure skating and freestyle skiing, rotational box jumps are an important dryland training exercise for off-season preparation. 1. Select a box height that suits your jumping ability. This can be executed as a static start jump or a countermovement jump. 2. Initiate the jump with a strong upward motion delivered primarily by the lower body. An upward arm swing can accompany the lower-body push. 3. The arms, shoulders, and head, moving aggressively in the direction of the desired motion, initiate body rotation for the jump. As the upper body and torso rotate, the lower body follows. 4. The magnitude of rotation is determined by the orientation of the upper body. Rotation will be 90 to 360 degrees, depending on the specifics of the sport. On landing, the upper body faces the direction of the desired finishing position. Landing with the simultaneous contact of both feet on the top of the box provides a stable base of support. 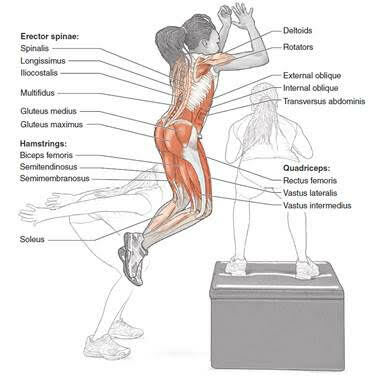 Learn more about Plyometric Anatomy at www.HumanKinetics.com.